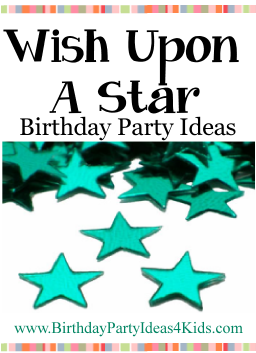 Wish upon a star is a great birthday party theme for kids of all ages. Out of this world ideas that will make a birthday party that your child could only wish for. Party ideas, invitation ideas, decorations, activities, crafts, games, food, party favors, goody / loot bags and much more. Stick silver star stickers on a dark blue invitation. Print party information on the inside and include silver star shaped confetti inside. Inside the invitation write "We wished upon a star that you would be at ________'s (insert birthday childs' name) party! Decorate with blue, black, silver and white. Use helium balloons with stars printed on them or draw stars on black balloons with a white paint marker. Buy a large light up star and place it high in the trees of the party venue so everyone can see it when they arrive. Have a sign in the front yard that says "Wishing Star ... Make a Wish!" so they can stop and wish on the star before they enter. Hang strings of smaller lights in all the trees and bushes to make it look like it is a starry night. Use a blue table cloth on the party table and put glitter down the center. Hang strings of lights from the ceiling and around the party table. Make star shaped wands and place them at each place setting. Make smaller star shaped wands and print out the name of the foods you are serving in the center and place in or near the bowls / plates of food. Set up a table in the party area with star shaped paper (about 4" x 4") and different colored markers and pens. Ask each guest to write a birthday wish or blessing for the birthday child. After the party take the birthday wishes and make a scrapbook page or frame them. Make stardust art with sand art necklaces, paintings or containers. Find kits in fun colors and let guests make a necklace, painting or container to take home as a party favor. Played like traditional tag except the player who is "it" holds a star shaped wand. They must tag the other players with the wand. Once players are tagged they must freeze and can't move until another player comes by and tags them. When everyone is frozen a new "it" is chosen. Star Hop - To play this relay race game guests are divided into two teams. Each team is given two large star shapes that are cut out of poster board. At a distance from where the teams are lined up place two cones or objects that the players will have to go around before they go back to their team. Players will use only the two stars to move across the playing area - they will have to put one star down, step on to it, then place the next star in front of them, step on it and reach back to pick up the first star. The first team with all of it's players completing the relay wins. Variation: A fun way to play this game is to have the whole team move at once. Give each team one more star then they have players. They will have to work as a team to get all the players standing on a separate star then move the back star to the front so they can move ahead. Before the party hide lots of star shaped items (make from cardboard or use plastic stars) all over the backyard or area where the party is being held. When it gets dark give each child a flashlight and tell them to search for the hidden items. Provide sacks or bags for the kids to hold their treasure (use black or dark blue paper bags and let the kids decorate them with stars during the beginning of the party when guests are arriving). Write numbers on the stars that correspond with prizes. After the treasure hunt the party guests can trade their stars for prizes that match the number on the back of their stars. More fun Party Games for all ages! Bake large star shaped cookies and let the kids decorate them with icing and different types of sprinkles.